What are the largest sized boards that can be turned? Shark Fin has turned boards up to 6″ x 12″ successfully. What speed can Shark Fin run at? 75LPM or less is ideal, this makes Shark Fin an excellent solution for hardwood mills. This is dependent on several factors including table length, number of graders, and lug pitch. On average one-grader systems start around $18,000 with the largest systems around $60,000. This is very economical compared to other board turning or grading systems. How do I get it quoted? There is a simple 1 page quote request form that can be found by region here. NOTE: The quote is not valid if a sawmill engineer needs to get involved. Redwood Plastics and Rubber provides *parts only*. Installation and design support is not available unless a sawmill engineer is brought in. We have all regions of North America covered. What is the lead time to get my system? 4-5 weeks is the standard delivery time. Can I have it quoted “piecemeal”? The Shark Fin system is designed to function as a kit. Removing any portion of the kit may result in substantially lower performance of the over board turner. The only case a substitution or declining of components is when a direct substitute is available. For example, certain sawmill engineers use their own plastic drive sprockets with the system. What does the spare parts kit come with? Each Shark Fin system comes with a spare parts kit. It comes with a couple lugs and an extra turner star. Extra parts in the future can be purchased from Redwood Plastics and Rubber. If our parts are defective and discovered within 30 days of delivery, we will replace them. However, there is no refund on the system itself. What are the advantages of Shark Fin over competing systems? Shark Fin is simple and relies on gravity for its turning power. This means that Shark Fin will not cost you extra money and the simplicity makes it very cost-competitive with more complicated competitors. We also have many testimonials from customers with a proven track record over decades of use. For more information on the Redco Shark Fin Board Turning System contact an expert today. Plastic 81X sawmill sprockets are primarily a molded product, this is to reduce delivery times as well as cost. The standard sprockets available from Redwood Plastics and Rubber have a hub that is 3-3/4″ wide (length-through-bore). Often these days customers want a thinner hub to fit into their sawmills and in most cases that’s fine! All we need to do is machine down the hub on our solid idlers. In addition, our split idlers have special “short” hub that’s available that’s available which reduces the width to only 3.0″. Length through bore narrower than that; however, are not possible as there is no more “meat” to machine away – the bolt holes get in the way. You will notice there has been no mention of a “old style split idler” in this conversation that is because unfortunately there is no “short hub” design for that particular part. For other customers, maintenance is limited and customers do not want to have to regularly grease the sprockets. In this case we can mold them out of an alternative version of the polyurethane used for our regular sprocket line. This plastic is called “Redco 750 SXL” and is lubrication-impregnated so it will not need to be greased. 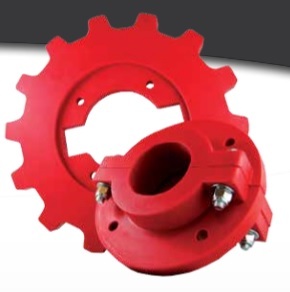 In the case of the solid sprockets, the entire sprocket can be cast as 750 SXL (including the split idlers). In the case of our new style splits where the A-plate and hub are separate, we can simply cast the hub as 750 SXL while leaving the A-plate as the standard Redco 750. Please note this will mean a mismatch in color, as the Redco 750 is red in color and the 750 SXL must be black due to the fillers it has. The final sprocket modification we get asked for is to reduce the bore size below what is our standard (1-15/16″) or to provide a sacrificial bushing in the bore. This is somewhat uncommon, but it does happen. In that case we will design a simple Redco 750 SXL sleeve bushing and can press fit that in. For assistance with your sprocket needs, please contact us today. 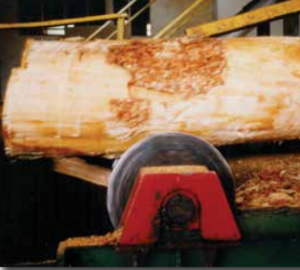 UHMW chain channel is used at most medium to large sawmills in North America. The product is wear resistant and slick, extending chain life. Primarily chain channel options are for H78 and 81x chain. Several profiles are available from Redwood Plastics and Rubber and you can view them HERE. However what if you need a different profile? What options are available? Actually, we have a few options to meet virtually any requirement. This is perhaps the most common custom chain channel option. If there is a profile that almost matches what you require, existing stock channel can be machined to suit. This is usually shaving the inside walls or base of the channel to make it more open or shorter. This does need to be quoted on a case-by-case basis; however, so do not assume this modifying is provided at no charge. This involves machining an entire channel profile out of solid sheet stock. It is the most expensive option per foot; however, often it is the only option for a profile that cannot be modified from existing channel. There are a few differences here: since the channel isn’t extruded it won’t be made of the “clean yellow” UHMW, instead it will be milled from reprocessed-black sheet. The milling will also result in a profile that doesn’t appear to be nice and smooth. You will see subtle ripples from the “dado” cutting. To mill custom channel you need to supply a drawing or otherwise work with a Redwood Plastics and Rubber representative to get the exact dimensions required. A custom extrusion profile allows you to get a customized channel that is made of the same clean yellow UHMW as the stocked profiles and the same slick, smooth, surface. There are three potential drawbacks to a custom extrusion. The first is the one-time tooling fee. This is usually a few thousand dollars and may not fit all budgets. Secondly, you need to require a lot of this channel to make it worth it: 1000′ linear feet is the minimum order. Thirdly, there is a long delivery for custom channel. Including the tooling you’re looking at about 8-10 weeks to get the first run. Subsequent ‘runs’ of custom channel are 4-5 weeks to ship. It sounds like we’re trying to dismiss custom extruded channel as an option – we’re not, it can be an excellent choice! However, you need to understand where your budget, time frame, and usage needs to be to make a custom channel worth it. If you want to discuss custom channel options, contact a Redwood Plastics and Rubber representative today. If you’re considering a custom lug or hook you need to consider an LSI plate. This is an insert between the Redco 750 polyurethane which provides added sheer strength for the hook or lug. They are not always necessary as some designs build up a “bump” of extra urethane around the mounting holes, which provides similar support. The LSI plate is made from mild steel and is sandwiched via a “press fit”. The holes on the plate are 1-1/2″ apart. 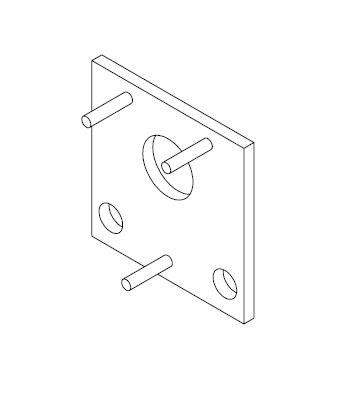 Even though the plate provides additional shear support that does not mean the hook or lug can take significant abuse. The plate is only 0.13″ thick. For assistance or a quotation on your plastic sawmill lug or hook needs, please contact Redwood Plastics and Rubber. Automation has been increasing in sawmills for decades. Redwood Plastics and Rubber’s own “Shark Fin Board Turning System” provided mechanical automation of board grading starting in the 1990s. Many industries continue to push for higher automation in order to reduce (human) errors, reduce costs, increase productivity, and therefore increase profits. Automated grading systems are one of the biggest developments in this area, removing what was once a job that could only be provided by skilled workers. Automated sorters are able to accurately seperate and classify lumber and computer systems can scan and automate saw processes. Further automation will likely follow the recent fad of diverless vehicles and trucks. Within a few decades it may be common to have automated trucks entering the lumber yard and stacks of lumber being loaded by automated forklifts. Where do humans fit in this new world? There will always be need for supervisors and it’s also likely that – just like with the increasingly automated airline industry – a human is still going to be required as a backup in case of emergencies. One thing robots and computers do not do well is adapt to crises and changing conditions, whereas a human can. Increased automation will also require more complex vehicles and equipment, which probably means more maintenance people will be required. These maintenance crews will slowly adapt too – more than just mechanical knowledge, increasingly digital and programming skills will be required. There may soon be the day where the sawmill maintenance manager represents more of a preppy college kid than a blue-collar tradesperson. While automated and digital technology can streamline operations as is the goal, when that technology fails, skilled sawmill workers will still be required. Perhaps an underutilized plastic sawmill solution, Redco 9600 impact bearings serve an important role. They consist of a double-hardness polyurethane combined with a durable steel outer shell. The system is designed to provide easy-to-change components and self-lubrication properties. Designed for high-impact, low-speed applications such as hour glass rollers and log kickers the 9600 Impact Bearings also have a four-piece split assembly. This makes the bearings quick and easy to install. The 9600 Impact Bearings are currently manufactured with five face widths: 1-15/16″, 2-7/8″, 2-15/16″, 3-7/16″, 3-15/16″. The polyurethane component is your choice of Redco 750 or Redco 750 SXL based. The difference being the Redco 750 is the ‘plain’ red standard, whereas the 750 SXL is black and comes impregnated with liquid lubricant. The SXL is best if greasing or maintenance will be limited or difficult to do. For more information on these or other sawmill products please contact us today. Redwood Plastics and Rubber has discontinued their line of sprockets for H78 sawmill chain. However, their 81X sprocket, which is now standard, is perfectly suitable for use on H78 chain. The difference lies in the thickness of the A-plate which holds the teeth. The H78 mold was 1″ wide whereas the 81X sprocket A-plate is 7/8″ wide. This subtle difference should see no difference in wear or performance in your sawmill. Plastic sprockets continue to offer increased chain life and reduced noise in your mill. Redco sprockets made from durable Redco 750 polyurethane are a tried and true solution for sawmills. They are available in both idler and drive variants with the idlers being available from 8-18 teeth and the drives from 10-15 teeth. Standard bore sizes are 1-15/16″, 2-3/16″, 2-7/16″, 2-15/16″. Smaller bores can be accommodated by supplying a machined insert, essentially a bushing, into the hub’s bore for an additional fee. While the current standard sprocket has a separate A-plate and hub, Redwood Plastics and Rubber can supply an “old style” split or solid idler sprocket. Drive sprockets are only available split. For more information or a quote on Redco polyurethane sprockets for sawmills contact Redwood Plastics. Current State Of The Softwood Lumber Dispute: All Bark And No Bite? As the softwood lumber dispute between Canada and the U.S. continues despite the angry rhetoric from both sides, it appears that the duties the U.S. Trade Commission applied to Canadian softwood lumber haven’t had a large effect. According to an article by CTV, softwood lumber remains at very high prices. In fact, even though exports from Canada to the U.S. have gone down by ~8%, the value of those shipments actually resulted in a 0.15% rise overall. The increase is even more pronounced in the Canadian provinces of Quebec (exports up 3%) and Ontario (exports up a whopping 11%). Why? The reason seems to be “insatiable” demand from the U.S. housing sector which is building at a torrid pace. To the point that increases in lumber costs are passed on to the purchaser of the home but also American home-buyers are currently willing to absorb the increase…So far. The worst hit; however, is the province of British Columbia who has seen exports drop by 33%. This is in addition to a terrible 2017 fire season which affected the total of harvestable timber. However, the news isn’t all bad, as exports from British Columbia to the rest of the world are up 67%. For the central Canadian provinces of Quebec and Ontario, lumber sales to the U.S. make up almost the entire timber production of those provinces (98 and 99 percent respectively). The core issue here has to do with dumping: American producers say Canadians are charged too small of a stumpage fee by the government to log Canadian land and in addition, Canadians sell lumber into the U.S. at artificially low prices. Canadians have appealed these duties to both the NAFTA dispute panel and World Trade Organization. A verdict from the former is expected in the fall of 2018; however, a ruling by the WTO could take years.